Tmux is not something you can use on windows, sorry. Questions/Critiques are welcome (and encourage). Entered i, I, a, A, o, O and others. Technically there are more then three modes, but they are mostly subsets of the three previously mentioned. 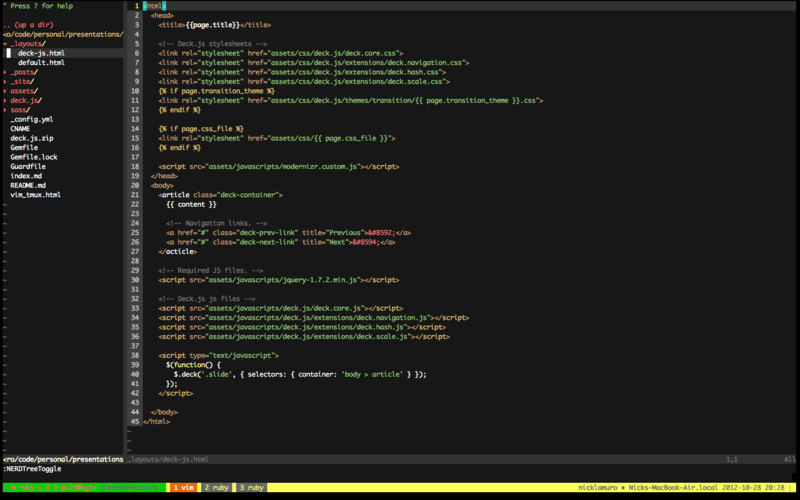 If you are curious and want to learn more, type :help vim-modes while in Vim to learn more. In Vim, help docs are available inline on a variaty of subjects regarding Vim. Just use the :help [keyword] to get started. By Default, you are also required to save before quiting. To override this, use :q!. Or to make it one step, use :wq. To delete a buffer (close a file in Vim), you can type :bd. One thing to keep in mind is that by default, vim won’t let you switch between buffers without saving the current buffer you are in first. This gets old pretty quick, and is not helpful when you are just using one file as a reference. To get around this, you can set the ‘hidden’ option (:set hidden) which will let you swtich between buffers freely and keep your undo history for each. By default, it will split the current split (or window) in half and use the current buffer that is in the original split to display in the new split. The buffers are shared between split, so you are able to switch between them freely. But these all go away once you close vim, so how do we persist these settings? The .vimrc for you should live within your home directory. bind-key r      source-file ~/.tmux.conf; display-message "~/.tmux.conf is reloaded"
The default prefix key is also not that easy to use, and while it doesn’t conflict with a whole lot, it still is nice to have a prefix key that is convenient to use. 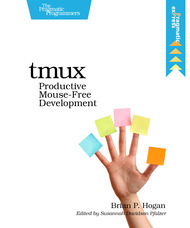 This book is not only a great intro to tmux, but was also a great reference for me when writing these slides. It’s only $11, so you have no excuse not to get it!